Today marks the two week anniversary of the birth of my new knee. Like most newborns, it has its good moments and its not so good moments. Sometimes it is all smiley and happy and giving me lots of love, and at other times it is just downright cranky. I have been very proud of myself for getting by on tylenol and ibuprofen. No one thought I could do it, but I am made of pretty tough stuff. Well, that is until I get to physical therapy and even there, until today I have been able to grit my teeth and bear it. Today was the breaking point. My physical therapist made me cry. It was spontaneous, couldn't stop myself, crying. I mean, I didn't wail or gnash my teeth, but I did cry. My sister, who was waiting for me heard it and started to jump up and deck someone. Thank goodness she restrained herself. Physical therapy after knee replacement is never fun, but they usually tell you to take a narcotic pain killer an hour before the session. As I can't take narcotic pain killers, I am going in there with my gloves off, so to speak. So, I will be working really hard at home over the next three days to get my knee to bend more. That way I can cry in the privacy of my own room. 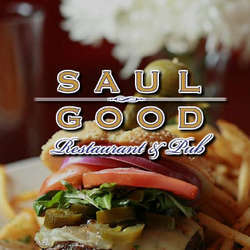 Oh yum, Saul Goods here we come. I really am on my way. I'm just a little slowed down because of the walker. Yes please, I'll have the grilled tuna salad wrap with seasoned fries. Ahhhh!!!! I am feeling like a human being again, but I think this has been a pretty full day and I hear a nap calling my name. I'm so glad you were able to get out and go to your favorite place for lunch. You've made it two weeks and it will get easier. Physical therapy is no fun but keep working at getting that knee to bend and it will all be worth it. Ouch! I know the physical therapy hurts. You are doing great! Glad you got a lunch out! Girl, you are a brave woman!! is all I can say. I'd be saying where are the drugs... I feel for you and hope that things continue to get better and better. Sounds like you are off to a brave start. I am so glad your sister is there to help and that you have a wonderful lunch. That always makes things better. You deserve that time out for that great lunch. Physical therapy is never fun. Good for you for avoiding the narcotics. I was told to take two every four hours. I took 1/2 once every few days. With determination like yours, you'll recover faster than what is typical. Your lunch looked yummy. I never ever think of taking pictures of my food at diners, restaurants or semi-fast food places... but, I should. My husband and I went out for lunch today and we had fish tacos and quiche lorraine. We split it. I had one of his taco and I cut the quiche in half. The tacos were better than the quiche. Slow but sure you will win this race! Glad you had a little reward for all of your hard work! I' m so glad you were able to do something fun! Hope you continue to feel better each day. Hope your recovery goes well. No pain, no gain?? Glad you could enjoy a nice lunch out. YUM, now I want fries. That's great you spent some time out getting some fresh air (and good food). So glad you had the chance to get out with your sister and have a fun time! I can't even imagine the pain you feel going thru therapy. I can handle alot of pain too, but not sure about something like that. Best wishes! It will all be worth it! Glad you got out for some lunch! Have a nice weekend! Keep it up, I understand it can't be easy...but the benefits are so much more in the end. I only wish that my Dad would do a little more after his hip operation...he needs to move. Oh you poor thing! Good luck with the PT.